Royalty Rewards® is a unique program at Humpy’s that rewards you every time you visit us. For every dollar you spend, you earn points towards FREE Loyalty Certificates from Humpy’s. Stop by our hostess booth to receive an application! A guaranteed return with every purchase. 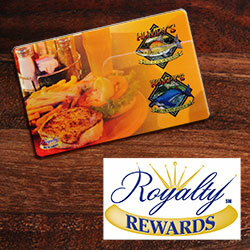 When you make any purchase, simply present your Royalty Rewards® card to your server. If you do not want to carry a card, you can add your membership number to the Free Royalty Rewards® iPhone or Android App (available in your phone’s App Store) and we will automatically track your purchases and assign points to your membership. It’s FREE… Seriously! There is no charge or fee associated with the Royalty Rewards® Program. Just fill out the application, turn it in to us, and start using it right away. Certificates are good for future purchases. It’s a “Thank You” card. Use it whether you pay with cash or credit card. You can even use it with other incentives for additional savings. Download the iPhone or Android app from your phone’s App Store and you can add your membership number so you never have to carry your card (the app also allows you to store other membership card numbers and has a QR code reader).